This article is part of our Complete Guide to Chiropractic Marketing. Images and photos are an aspect of chiropractic marketing that doesn't get enough attention. The web is a visual medium. The vast majority of content that people view online is photography and video. Images play an important role in how people interact with your business. 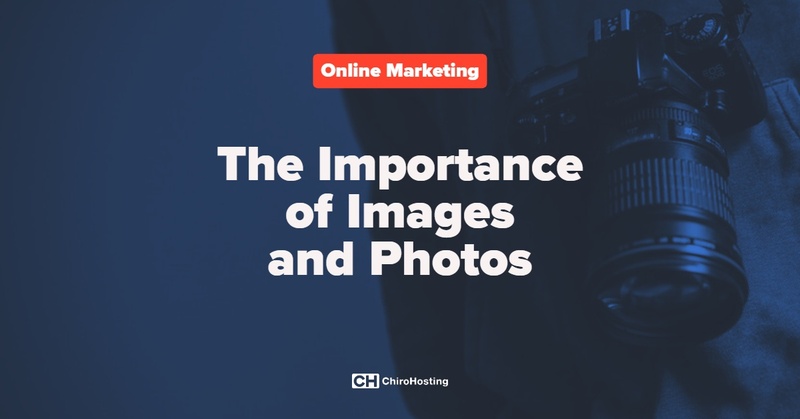 In this article, we'll talk about some of the things you need to consider when adding images to your chiropractic website and social media profiles. When a patient is first visiting your website, you want them to feel comfortable and confident about booking an appointment with your practice. You need to have a website that's clean, easy-to-use, and professional looking. Quality photographs make a huge impact. First impressions are key. Patients expect to see a photo of you with your biography. They'll also expect to see photos of your office and staff members. While modern camera phones are very good and it's tempting to do it yourself, quality photography is something that should be done by a professional, especially with the doctor's photo. Getting a professional, properly lit headshot of the doctor is key, and worth the small investment. You can use this photo in all of your online and printed materials, and will be usable for years. For a bit more money, you can have the photographer come to your office and take photos of the doctor, staff, and office (indoors and outdoors). We've seen a lot of chiropractic websites over the last 20 years, and poorly-lit, blurry photos make a bad impression. That's not the first thing you want patients to see. It's so easy to find photos online. Just go to Google Images and you can find any image imaginable in just a few clicks. The problem is that these images are copyrighted and you can't use them on your site without permission. While it's easy to steal images from the web and put them on your site, it can be very expensive in the long run. For the last six years, Getty Images has been contacting websites and sending demand letters of $800 per image for images used without a license. That free image doesn't seem so great when you get one of those letters! With your chiropractic website from ChiroHosting, you're provided with a library of hundreds of licensed stock photos that are available to use on your website. You can use any of those images on any page of your website as long as you're using our website service. Pay for the images. There are many inexpensive stock photo websites out there that allow you to purchase licenses for images for about $5 per photo. You can try Dreamstime or BigStockPhotos; they have excellent images for purchase. Search for Creative Commons license (CC0) images that allow commercial usage. These are photos that photographers have designated as free for anyone to use without restrictions. Be aware that there are multiple Creative Commons licenses and some do not allow commercial usage. Website PageSpeed is an important ranking factor for your chiropractic website. A site that loads slowly will often be penalized by Google, because they provide a poor experience to users. Image size is an important factor in how quickly a page will load. While a fast-loading web page will be about 100k in size, a high-quality photo can be 20 Megabytes. If you add that image to your site without optimization, your site (and site visitors) are going to suffer. Optimizing images means using software to resize images to the dimensions and quality that fit your website and load quickly. An image that is originally 20 megabytes can be optimized down to 30K quite easily. There are a variety of software programs that provide this functionality, but you can also use websites to do it for you. Just search Google for "Image Optimizer." Online marketing revolves around Google, and if you're a local business (like a chiropractor) Google My Business is one of the most powerful tools in your arsenal. Google My Business is how you show up in Google maps and searches. When people search for "Your City Chiropractor” or even just "Chiropractor,” Google My Business listing are at the top of the results. There are many aspects of Google My Business that you need to work on to improve your search ranking, and one of these is images. Research shows that good images in Google My Business increase view and traffic to your listing. A recent survey by BrightLocal found that 60% of people are more likely to visit a Google My Business profile if it has photos and 23% are more likely to call for an appointment. Google My Business makes it easy for you and your patients to add photos of your business, and Google provides some guidelines on the types of photos you should add to optimize your listing. Social media is a different environment than your website, and this is where you'll want to share images that are a bit more relaxed. Facebook and Instagram are great places to share photos of office events, parties, and patients (with permission, of course). On social media, you'll want to share content that's inspirational or educational with good images. You can find this content on Facebook yourself, or you can create your own. As part of our Automated Chiropractic Social Media service, we share daily news, videos, and inspirational images on your feed automatically, if you don't have staff resources to do that yourself. This content gets quite a few shares and likes with doctors' patients.